Jamie wants to be the real thing, right down from the roots of her dyed-blonde hair. 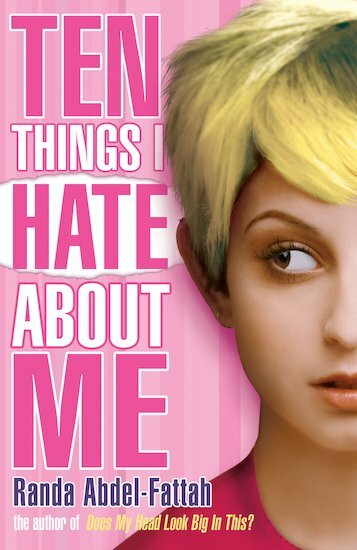 But there lots of things that Jamie hates about her life: her black hair, her stuffy old dad, and her real name – Jamilah Towfeek. Most of all, she hates herself for hiding her Lebanese-Muslim background from friends at school. The only person she can confide in is the anonymous boy she chats to online. But now the best-looking boy in her class wants to date her. Her dad will never allow it, and her double life can’t be a secret much longer. Who will find true love – Jamie or Jamilah? Funny, topical and heart-wrenching, this is a moving and richly believable story of family loyalty, identity and finding oneself. Randa Abdel-Fattah is a 26 year-old Australian-born Muslim-Palestinian-Egyptian-choc-a-holic lawyer. Having grown up in Melbourne, she now lives in Sydney where she is active in the inter-faith community. She loves travelling to Egypt and Palestine and being spoilt by relatives. She also loves reading, watching romantic comedies, her husband’s sense of humour, getting a seat on the train, and any movie starring Colin Firth. Randa is married with a baby daughter.